When I was about 5 or 6, my mom and stepdad took me to Six Flags Magic Mountain. I had a terrible day. The rides were too scary, the larger-than-life Bugs Bunny and Elmer Fudd were terrifying, there was sooo much walking…I’m pretty sure I did nothing but complain or cry the entire day. (Sorry, Mom.) I don’t know why, but for years afterward a colorful map of the park from that day was on the wall next to my bed like a poster. While I hated the ACTUAL amusement park, I loved that map. As I was drifting off to sleep, I would run my fingers over the map, imagining walking along those paths and going to see all the fun, colorful landmarks (which looked so much more appealing on paper than in real life). Despite the wide acceptance of GPS and smart phones, I think it’s important that my kids know how to read a map when they are older. We recently had a family vacation in San Diego and went to Sea World and the San Diego Zoo. When I got home and saw the crumpled up maps in my backpack, I decided to make it into a homeschooling activity for my kindergartner. Thankfully, we’d also saved a Legoland map as well. 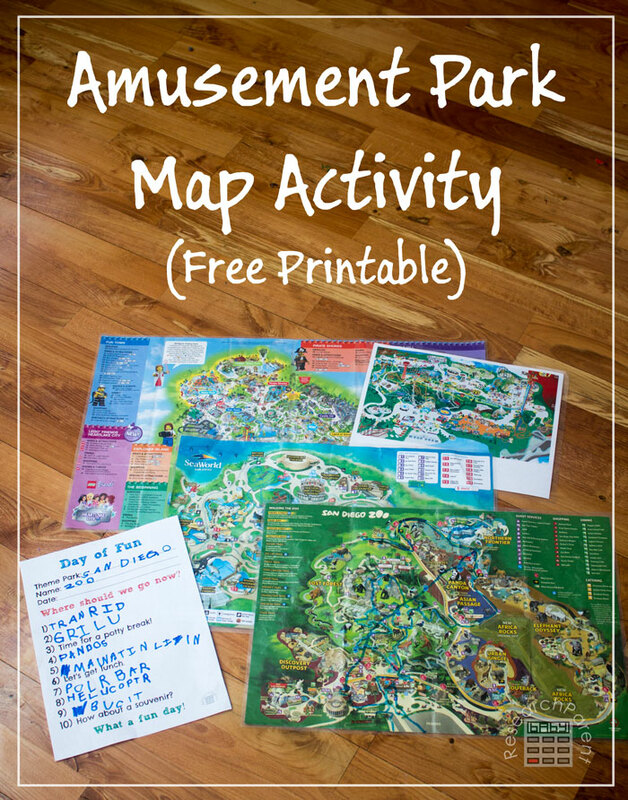 Large amusement park maps definitely work best for this activity, since they are so easy to read, but no worries if you don’t have any saved. Just google “map” along with your theme park of choice and you’ll almost certainly find a printable map. 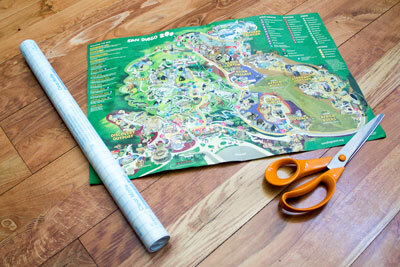 There are so many options when it comes to amusement park map activities. 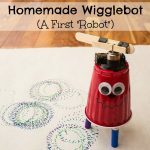 With the youngest kids, just look at the pictures and describe the things you see. When they’re ready, show them the paths and how you can walk from one landmark to another. Show them how they have to take into account barriers like bushes and buildings when deciding where to go. Ask them to plan a fun day while drawing on the laminated map to show the paths they would take. As they find all the things they want to see, interrupt and ask them to find certain things along the way: restrooms, food, first aid, shops…This way they can learn how to interpret a legend and the meaning of different symbols on the map. Have them write out a story about their fantasy day. Give them a show schedule and ask them to plan out the day around the shows they want to see to minimize walking and still see everything. 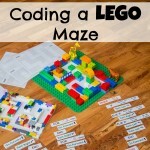 While map activities are definitely open-ended, I’ve made a free printable to get you started. Contact paper for large map or laminating pouch for printed map. 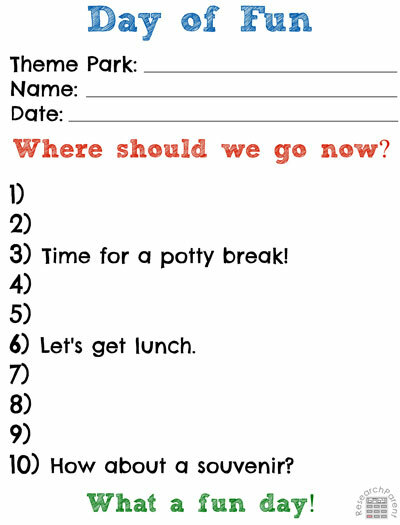 Print out the Day of Fun activity sheet (if using). 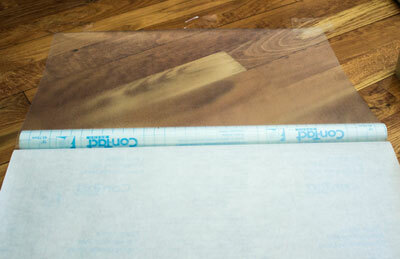 Cut 2 pieces of contact paper big enough to cover the map. 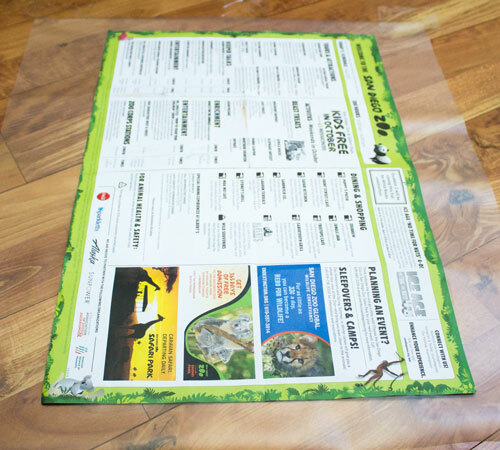 Place the map on a peeled sheet of contact paper. Peel the backing off the other piece of contact paper and lay it on top. 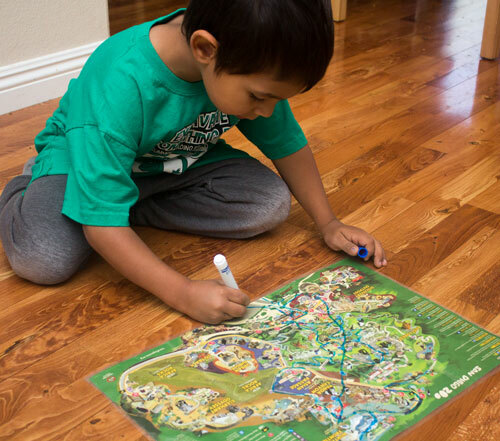 Once you have a laminated map, you can give your child a marker and let them have fun “planning” their day on the map. My kindergartner wanted to make sure we did the “tranrid” (train ride) and saw the “grilu”s (gorillas). His spelling may need some work, but I love when he is motivated to make the effort to write on his own. HAVE FUN PLANNING YOUR FANTASY DAY! Click here for more Geography activities for kids. What a great idea! My kids LOVED the maps to the one theme park we took them to when we lived in Massachusetts. We are contemplating a Legoland visit since my brother is getting married in San Diego in December. Maybe I should print off some maps for them in the meantime. My kids LOVE Legoland. I’ve heard it’s not that great for kids that are over about 10, but we go about once a year and my 3 and almost 6 year old like it more than Disneyland. We’ve been lucky in that we go with our local homeschooling group and the tickets are only about $20. I can’t believe how high the regular admission is. 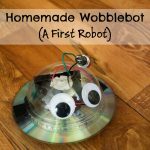 If you were looking for something more local to San Diego and less expensive, the Reuben Fleet Science Center is a little dated, but fun, and the San Diego Natural History Museum is really modern and impressive. My kids love both of those places too.